Lew gave me a chance to sleep in in the little cottage in the backyard. After I got a shower and packed my bags again, I was offered another look on the menu of the Mt. Elephant Pancake barn. �We sure had some stimulating conversations last night, didn�t we?� Lew asked from behind his office desk in the back. �Sure we did, I quite enjoyed that!� And I selected a pancake with ice and whipped cream. That would do great as a brunch meal. Lew told me he could drop me down the road, when I was ready for departure. 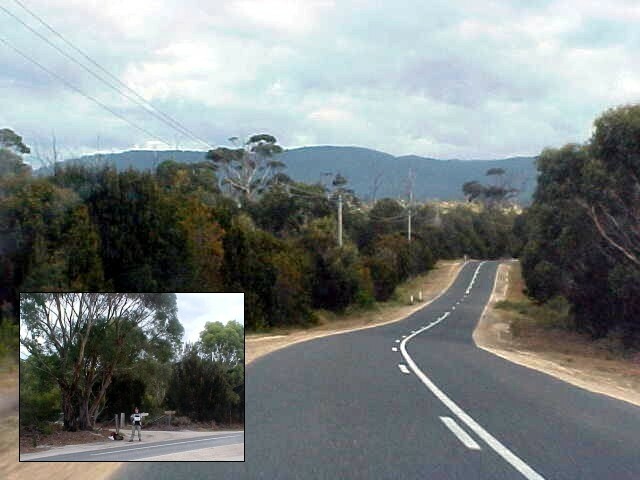 It was around 2pm that he dropped me off, down the streets � 30km further up � on the road going south towards Hobart. Only 200km. It took me quite a while to get a ride. It was Monday and I noticed that only ten cars just passed me within one hour. Mmm. This could take a while. Fortunately I got a lift from a teacher in St. Helens (place up north) named John, who could take me up to Bicheno. As we drove along the eastern coastal road down south he told me about his travels in his past. He also gave me the best advice for luck during hitchhiking. �I only hitchhiked one, in Israel, and let me tell you: just make sure you don�t look like an Arab, and you�ll be fine.� I hope that only counts for hitchhiking in Israel, then. On the road to Bicheno he had to pull over and show me the long-stretched beach there. �I once was here and noticed somebody else on the other far end. I decided to go home again, because it was too busy,� he joked and we laughed. This sure is an undiscovered lovely beach, where it would never get busy. Down the road south of Bicheno it took me another half an hour to get a ride. An old man took me along as he had to go to Swansea, also down the road (yep, that�s 30km). He wasn�t really talkative, so I enjoyed the scenery while I was in the car. I also noticed how the good man was driving from one lane to the other, it even got worse when we had the setting sun shining straight in our eyes as we drove up and down hills. I almost wanted to say: �Sir, the middle line, the middle line,� at least a few times. But he corrected himself every time. In Swansea I called up my hostess in Hobart. It was already 5.30pm and the sun was about to say goodbye for the day. My hostess was worried that I wouldn�t make it to Hobart, which was still some 150km down the road. �What if you can�t get here?� she wondered desperately. �Then I�d just be stuck. That�s okay.� And I assured her it was my problem, she didn�t have to wonder about that. I knew I was running out of daylight time and yes, I might just had knock on a door if I wouldn�t make it to Hobart. �Well, just know that I can pick you up anywhere near Hobart, even at two o�clock at night, you hear?� She said and that was very nice of her. But there was Rob, a man who was transporting fish in the back of his fridge-truck. He had to go all the way to the Hobart Airport and could drop me off there! That was great! It was a long drive, up and down and around the hilly landscape of Tasmania and the coastline I could see from the distant changed in eastcoast to southcoast. When we approached Hobart it all had turned in a sea of little lights in the darkness. It was Vickie Curtis, my hostess for the day, who picked me up at the airport around 8.30 this night. �We have to hurry, because the newspaper wants to meet you,� she said and really surprised me. �Where?� I asked. �At my house.� I felt a bit uncomfortable with that, because I rather am a bit prepared for interviews. They take time and energy and I was a bit out of energy at this moment. �I have called all the media about you and about your visit to Hobart, isn�t that great?� It all depends on how much media she had called, I thought. I have to tell you that Vicki almost screamed my head off when she found out that I was calling her about stay a day at her place in Hobart � a few days earlier. It took over two minutes of convincing her that it was me. �No, this is a joke. Which radio station is this?� she asked me. No it is I. And she went crazy. I told her that I wasn�t that special, she had invited me to stay for a day and I called her about that. What�s the big deal here? But to her I was famous, world famous. And I was about to visit her. I truly got a bit scared there. Honestly I was getting a bit overwhelmed. For the time I was in the car everything that was happening was about me, me and me. It scared me again. When we arrive at her humble home she shares with a little dog Poppet, in the suburb West-Moonah, she tells me that I have to help myself with dinner. �I don�t eat,� she tells me. Huh? How? "I never eat. I live on lots of milk and coffee all day. And I smoke a lot,� she said. I could certainly notice the cigarette odor in the house, but I was more startled with her non-eating thing. She showed me what she had in her kitchen cabinets; �I even went shopping for you,� she said and showed me that she bought corn flakes for me. �Or shall I order you a pizza?� she asked while we were browsing through a cabinet with cans and pots. And she ordered pizza. The reporter Jane and photographer Jim from the Mercury newspaper arrived and Jane was very amazed with my actual presence in Hobart and travelling background. We had a simple conversation about my project, basically telling again what can be found on the first five pages of my website. She was intrigued and I liked to keep it that way, because she was from The Media. Always answer questions from the media the right way, a wise man once told me. The pizza arrived shortly after the interview and I was kinda surprised because she bought me two pizzas and I wasn�t really that hungry. That thought came to me thinking that I was the only one that eats in the house. For that reason (not being that hungry) I could just only eat two slices. �Do you also stay with people that eat at a table, like with a glass of wine?� Vickie asked me. That struck me again. I couldn't figure out if she really meant that question or if she was joking. I decided to give my honest answer: �Yes, most people I stay with have dinner at a table. Sometimes with a glass of wine yes,� I replied. And she laughed out loud as it was the biggest joke in the world. She just could not believe it. Partly I couldn�t believe Vickie. The rest of the evening was spent behind our PC�s. Vickie was typing out somebody�s handwritten book, so I got behind my computer updating last week�s stories. When she later was finished she watched TV, the �Who wants to be a millionaire?�-show, where she wondered with every question on the show if I would fancy calling a help line for the answer. With me sitting behind my computer, being busy as usual, I soon found out that Vickie had disappeared. From her open-door bedroom I heard some snoring. I guess my hostess had gone to bed. Good night Vickie.